Open tracking tells you if your contacts open the emails you send. Your campaign report will show which contacts opened your campaign, and how many total opens the campaign received. Compare open results to other data in your account, such as e-commerce activity, to learn about contacts' behavior. You can use open statistics to segment your audience, target contacts, and send follow-up emails. In this article, you'll learn about open tracking, how to view open results for your campaigns, and how to disable open tracking. 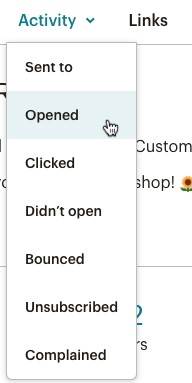 Each time you send an email campaign through Mailchimp, we embed a tiny invisible graphic in the bottom of your HTML email. This open tracker graphic, or web beacon, is unique to each campaign you send. When someone opens your email with images turned on, that graphic is downloaded from our server, and it's recorded as an open on your campaign report. Automated replies, such as out-of-office messages, generally do not download this graphic, so they shouldn't count as opens. Web beacon trafficking is the industry standard for open tracking and is a great tool to give you a general overview of your subscriber engagement, but it does have some limitations. Because it relies on a hidden graphic embedded in your campaign code, open tracking won't work in Plain-Text Campaigns. Similarly, open tracking won't work if your contacts or their email client have chosen not to display images. You can ask your contacts to add you to their address book, or choose to display images in their email client to get more accurate open tracking. There are two ways to access your open results from the Reports page in your account. The open results on the Overview tab include numerical totals for all of your contacts, while the results from the Opened and Didn't open tabs show you the individual contacts who opened or didn't open your campaign. To view the open rate and total number of opens from the report Overview, follow these steps. Navigate to the Reports page in your account. Click the name of the campaign you want to work with. We'll display the Open rate and Click rate on the Overview tab, as well as the total numbers for opens and clicks. Here are a few terms related to open tracking that appear on the Overview tab, along with their definitions. Percentage of total recipients (successful deliveries) who opened the campaign. Number of recipients that opened the campaign any number of times. How many times the campaign was opened by a recipient who was forwarded the campaign using a Forward to a Friend link. Only campaigns forwarded using the Forward to a Friend link can be tracked as a forward open. Campaigns forwarded using an email provider's forward button will not be counted as a forward open. Subscribed contacts who opened the campaign the most times. To view which individual contacts did or didn't open a campaign, follow these steps. On the Overview tab, click the Activity drop-down menu and choose Opened or Didn't open. These screens will display a full list of recipients that either did or did not open your campaign. To download a CSV file of the list of recipients you're viewing, click Export. You can also hover over the open or click percentage for each campaign on the Reports or Campaigns pages in your account to view the exact number of contacts for that statistic. Open tracking is enabled by default except on plain-text campaigns. To disable open tracking for a regular email campaign, follow these steps. Uncheck the Track opens box. That’s it. Now, we’ll no longer track who opens your email campaign. If it seems like your opens are being incorrectly tracked on your campaign report, there are a few things that could be happening. My open rates seem low or non-existent. Here are some common issues that can block open tracking or cause your open rates to be low. Was open tracking enabled for your campaign? Open tracking must be enabled before the campaign is sent to track opens in the campaign report. If open tracking was disabled for a campaign, there will be a notification at the top of the campaign report Overview. Have your contacts had enough time to open the message? It's common to see a low open rate in the first few moments after a send, so we recommend waiting at least a few hours to view open rates to give contacts some time to check their inbox and open your message. Was the campaign a plain-text Campaign? Open tracking relies on a hidden graphic that downloads when a contact opens your campaign. Because plain-text emails don't support images or graphics of any kind, opens can't be tracked. The tracking image may be blocked. In rare cases, your recipients' spam filters may block our tracking image. However, when contacts click a link in your campaign, we count that as an open if click tracking is enabled. If you think your tracking beacon is being blocked, we recommend you enable both open and click tracking to keep track of opens. Keep in mind your stats may not be 100% accurate, but will give you some usable statistics on your contacts' activity. Gmail has clipped your message. If an email message is too large, Gmail will clip content and hide it behind a View entire message link. When the message is clipped, it also clips the tracking code that accounts for opens. To prevent this, reduce your message size to below 102kb. My open rates seem high. Here are some common issues that can cause your open rates to be too high. A spam filter is causing high open rates. Aggressive spam filters will click links in incoming mail before delivering them to make sure there isn't any malicious content. Our system automatically tracks clicks as opens, and we have no way of differentiating when a click is from a spam filter. This can sometimes lead to an unusually high number of opens from a single domain. If you notice this on your report, it's likely the result of a spam filter. We recommend you ask your contacts to whitelist Mailchimp's servers. Your contact forwarded your email. When your contacts forward emails through their email client, any opens for the forwarded email are recorded as additional opens for your contact. Encourage contacts to use the Forward to a Friend link instead to accurately track your opens. 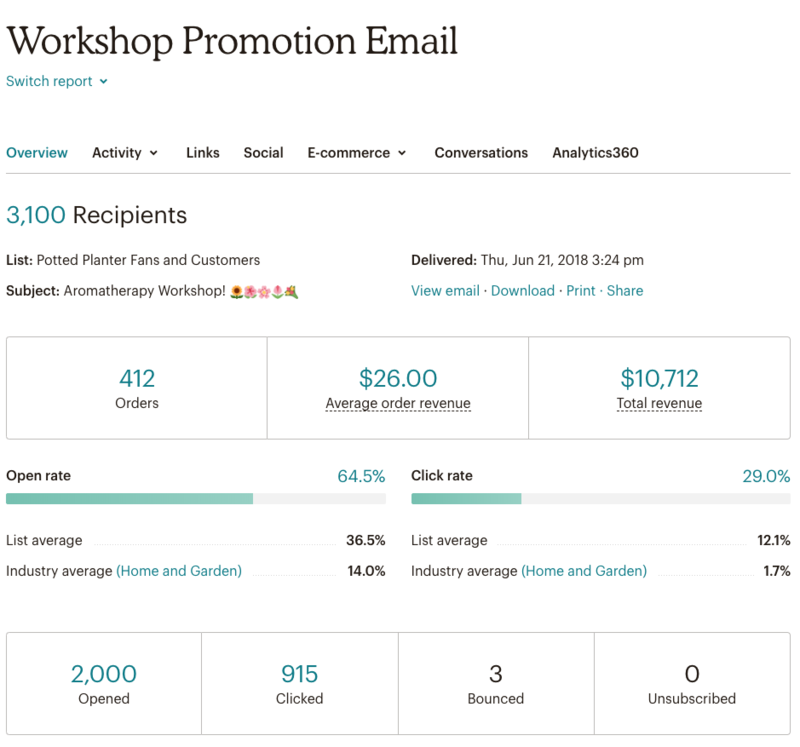 Mailchimp's reports include open and click rates. These rates help you track audience engagement. Use them to learn what subject lines and content perform well. Use Mailchimp's click tracking to see who clicked links in your emails. Learn more about how contacts interact with your campaigns.